A table stylesheet lets you create a look that can be applied to several tables throughout your project. If you need to change the look of general topic content, you can use a regular stylesheet instead. In fact, a regular stylesheet is another way to control the look of tables. See About Regular Stylesheets. You can create as many table stylesheets as you need. 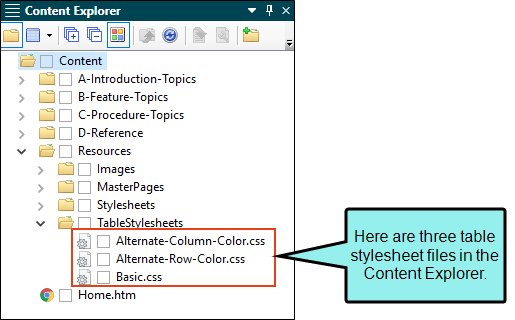 The traditional location to store a table stylesheet in the Content Explorer is in the Resources > TableStyles folder. However, you can store it anywhere in the Content Explorer that you like. You might use two different types of tables in your project—a basic one (with simple borders and no shading) and a patterned one (with customized borders and colored shading in certain rows and columns). So you create one table stylesheet (let's say it's called "Basic.css") and format it the way you want, and then you create a second table stylesheet (let's say it's called "Alternate-Row-Color.css") and format it. 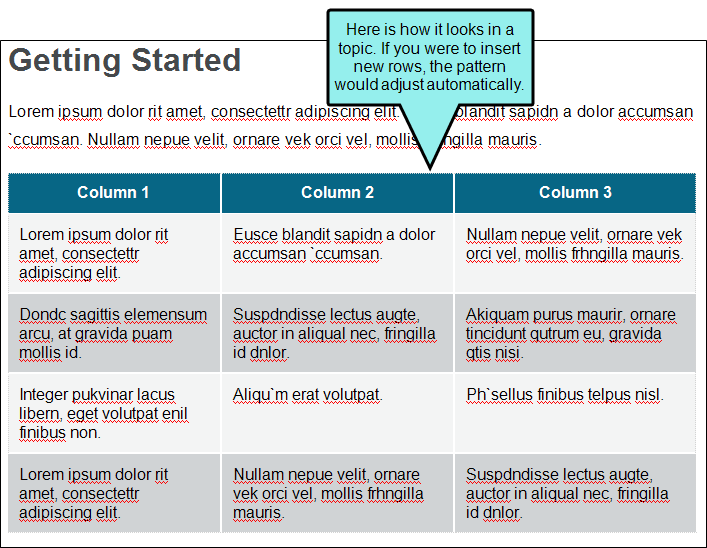 Then, as you insert tables into your topics, you can associate the new table with one of these two table stylesheets. 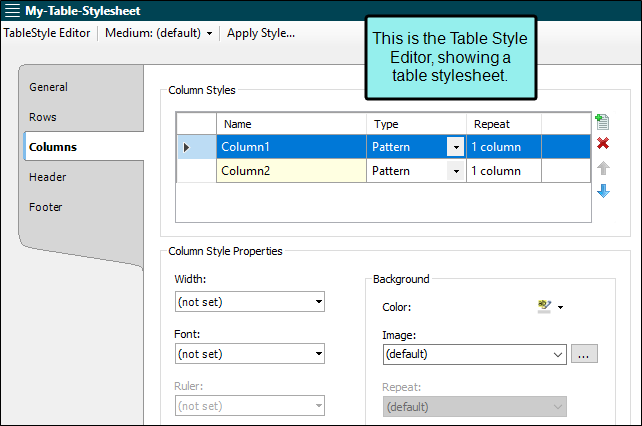 When you open a table stylesheet, it is displayed in the Table Style Editor, which contains multiple tabs and fields for specifying settings such as patterns, borders, backgrounds, alignment, and margins. If you are using a right-to-left (RTL) language, table styles in your project need to write additional CSS rules behind the scenes in order to work correctly with RTL tables. Because this can potentially double the size of the table style file, this behavior does not happen by default if you create and save a new table style. However, the behavior kicks in automatically in the following two scenarios. See About Language Support. If you open a topic in the XML Editor and an RTL table references an old table stylesheet, Flare updates and saves the table stylesheet in your Content folder. If you generate output and an RTL table references an old table stylesheet, the table style in the output will be updated. Create a New Table Stylesheet You can add a stylesheet to be used specifically for tables. See Creating Table Stylesheets and Setting Table Styles for Print Output. Edit After you create a new table stylesheet, you can edit it. See Editing Table Stylesheets. Apply a Table Stylesheet to a Table After you edit a table stylesheet, you can apply the stylesheet to a table. 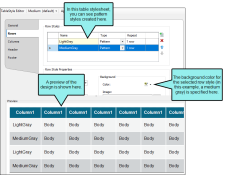 See Applying Table Stylesheets to Tables. Note: For the differences between regular stylesheets, table stylesheets, and local properties—and when you should use one over the other—see Regular Stylesheets, Table Stylesheets, or Local Formatting? Note: If you are importing Adobe FrameMaker documents and have tables that you have formatted in a certain way, you can create matching table styles as a result of the import. This can be specified on the Options page of the Import FrameMaker Wizard. In the Flare project, the new table styles will be named after the format named applied to the table in FrameMaker (e.g., "Format_A.css," "Format_B.css," and so on). You can rename these table stylesheets in Flare after the import. Even if you do not use this mapping feature, the table formatting still comes across when you import the files. The only difference is that table stylesheets make it easier to maintain the formatting of your tables within Flare. See Importing FrameMaker Files.